JitsuPRO has all types of data downloads. 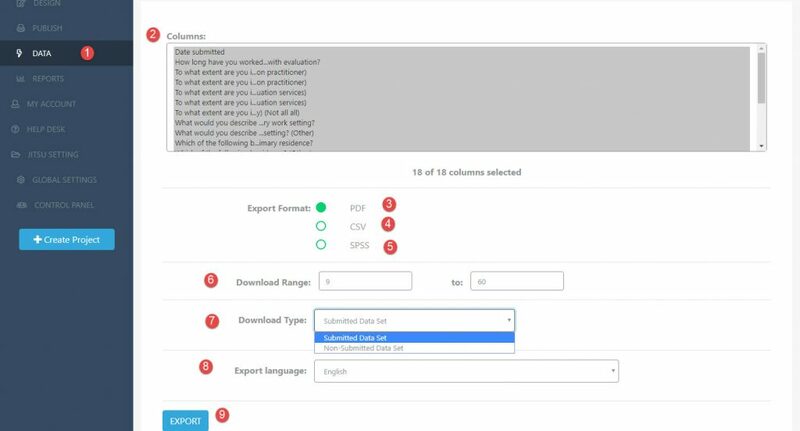 You can download simply as a .PDF or .CSV file which will show your question answers as inputted or you can download advanced as .SPSS which converts your question answers as numerical values. Once you have decided to close your project, it is time to decide whether you would like to store the data in .PDF, .CSV or .SPSS file formats. Simply click on the Export Button in the lower left corner and the file will appear in a web broswer such as Google Chrome the bottom left of the Interface. Click on the Data Tab to initial the download process. Download in .PDF Format where all question answers will be actual responses. Download in .CSV Format where all questions answers will be actual responses. Download in .SPSS Format where question answers will be in 0/1/2/3 for easy upload. The function will show the download range or responses. Download either Submitted dataset or Non-Submitted dataset which includes those of viewed and didn’t submit. Export language is set as automatically to English. Click Export and your file is ready to use.